When I won this book in a blog contest, I thought I knew what to expect. I was wrong. From the first page, "No Greater Love," by Kathi Macias plunged me into a historical time period marked by incredible evil. Chioma and her only living relative, a younger brother, work on the Vorster Farm in South Africa. She's learned to measure every word, every expression, and project the correct body language to survive. Trapped in a world where Apartheid strangles her people, she watches for an opportunity to get revenge on those she considers white devils. The Vorster family also knows tragedy and sorrow. Indoctrinated from birth that Apartheid is correct and even godly, they walk in deception. Will the Word of God and a small journal, get through to them? Kathi's masterful use of setting and characters took me on a journey I'll never forget. I walked through the jungle with Chioma, stared through her eyes at certain death, and struggled to forgive her enemies. Even though, "No Greater Love," carried great pain, I read it in two days. Seeing those years through the eyes of people, albeit fictional, brought a keen understanding of something I'd only read about in history books or newspapers. Have lots of tissues on hand before you read this story. Please note: Neither the publisher nor the author paid any fee or requested a favorable review of this book. Have you ever read a historical fiction book that impacted your understanding of a time period? I'd love to hear about it. I just got done with the first book in Tricia Goyer's "Chronicles of the Spanish Civil War," which is a period of history I've never heard much about. I'm putting this book on my gotta read list! Susan, I really liked Siri Mitchell's _A Constant Heart_ for this reason. It showed a completely different side of Elizabethan court life. I also just finished Allison Pittman's The Bridegrooms, which was really interesting because it had an unusual setting and involved very early baseball history. I cannot WAIT to read this book, which I just heard about yesterday. I LOVE novels set in other places, other times. And Kathi's a great writer! 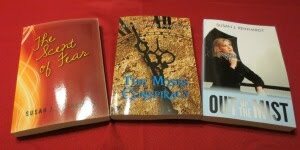 Yes, I have read many great historical novels. The children's book, The Bronze Bow by Speare is excellent. It takes place during the time of Christ and is about forgiveness. It won the Newberry Award. "Mark of the Lion" by Francine Rivers is amazing! I haven't read any of Tricia Goyer's books yet. This might be a good to start. Thanks for the tip. I read Siri's book, "Chateau of Echoes," and enjoyed it. I'll have to check this one out. I've heard of Allison Pittman, but haven't read any of her books. Thanks for the recommendation. I've never heard of this title. Thanks for bringing it to my attention. Biblical fiction enjoyed popularity for quite some time. 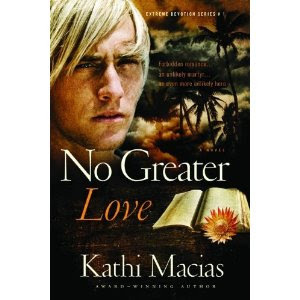 Thanks so much, Susan, for the great review of No Greater Love. I've published more than 30 books now, but this one is my all-time favorite! Thanks for stopping by and commenting. I'm looking forward to reading more of your books.